11.1.1 A faculty member shall be paid an annual salary in accordance with the following rates. Payment of wages will be processed on a biweekly basis and will be deposited directly to the credit of the faculty member’s account at a Canadian financial institution of the faculty member’s choice. Bi-weekly salary is calculated by dividing the annual salary by 26.0893 pay periods. * All salary adjustments will occur on the first full pay period after this date. Annual and Biweekly salary amounts will be impacted by previous Economic Stability Dividends as per the Memorandum of Understanding on the Economic Stability Dividend. 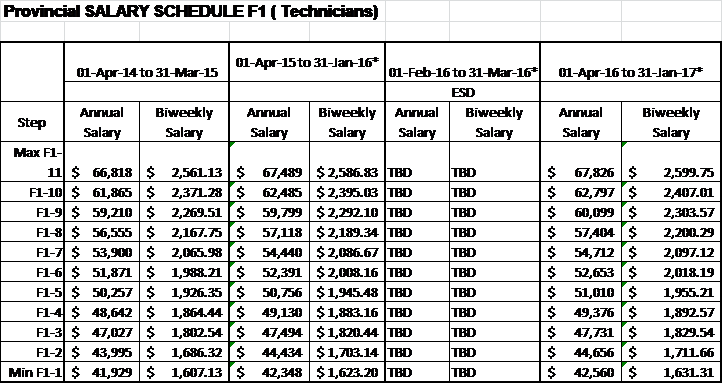 Provincial Salary Schedule F2 (All regular faculty and limited term contract Instructors, excepting Technicians). “Collective agreement year” means each twelve (12) month period commencing on the first day of the renewed collective agreement. For example, the collective agreement year for a collective agreement that commences on April 1, 2014 is April 1, 2014 to March 31, 2015 and each period from April 1 to March 31 for the term of the collective agreement. “Calendar year” Is a twelve (12) month period starting January 1st and ending December 31st of the same year based upon the Gregorian calendar. “Real GDP” means the GDP for the previous fiscal year expressed in constant dollars and adjusted for inflation produced by Statistics Canada’s Provincial and Territorial Gross Domestic Product by Income and by Expenditure Accounts (also known as the provincial and territorial economic accounts) and published as “Real Gross Domestic Product at Market Prices” currently in November of each year. The Economic Stability Dividend shares the benefits of economic growth between employees in the public sector and the Province contingent on growth in BC’s real GDP. Employees will receive a general wage increase (GWI) equal to one-half (1/2) of any percentage gain in real GDP above the forecast of the Economic Forecast Council for the relevant calendar year. For greater clarity and as an example only, if real GDP were one percent (1%) above forecast real GDP then employees would be entitled to a GWI of one-half of one percent (0.5%). The Economic Stability Dividend will be calculated on an annual basis by the Minister of Finance for each collective agreement year commencing in 2015/16 to 2018/2019 and published through the PSEC Secretariat. (iv) Advice from the PSEC Secretariat to employers’ associations, employers and unions of the percentage allowable General Wage Increase, if any, for each bargaining unit or group with authorization to employers to implement the Economic Stability Dividend. (iv) Direction from the PSEC Secretariat to employers’ associations, employers and unions of the percentage allowable General Wage Increase, if any, for each bargaining unit or group with authorization to employers to implement the Economic Stability Dividend. (v) Payment will be made concurrent with the General Wage Increases on the first pay period after respectively February, 1, 2016, February 1, 2017, February 1, 2018 and February 1, 2019. The Economic Stability Dividend will be provided for each of the following collective agreement years: 2015/16 (based on 2014 GDP); 2016/17 (based on 2015 GDP); 2017/18 (based on 2016 GDP); and, 2018/19 (based on 2017 GDP). Employers must apply the Economic Stability Dividend as a percentage increase only on collective agreements wage rates and for no other purpose or form. Regular part‑time faculty shall be positioned on the salary scale in the same manner as a regular faculty member. His/Her salary shall be the biweekly rate times the percentage of a full‑time workload consistent with his/her original appointment paid evenly on a biweekly basis. 11.1.3 Limited term contract Instructors shall be positioned on the salary scale in the same manner as a regular faculty member. For part time limited term contract faculty his/her salary shall be the biweekly rate times the percentage of a full-time workload consistent with his/her original appointment paid evenly on a biweekly basis. 11.1.4.1 A temporary non-instructional faculty member shall be positioned on the salary scale in the same manner as a regular faculty member. His/Her contract salary shall be the biweekly rate times the percentage of a full-time workload for the position times the number of biweekly pays falling within the contract period. Temporary non-instructional appointments include a vacation entitlement as outlined in Article 12.2.7. Effective the first day of the first full pay period after April 1, 2015, by one percent (1.0%) to $6,106.44.Effective the first day of the first full pay period after February 1, 2016: Economic Stability Dividend*. Effective the first day of the first full pay period after April 1, 2016, by one-half of one percent (0.5%). Effective the first day of the first full pay period after February 1, 2017 by one percent (1.0%), plus the Economic Stability Dividend*. Effective the first day of the first full pay period after April 1, 2017 by one-half of one percent (0.5%). Effective the first full pay period after February 1, 2018 by one percent (1.0%), plus the Economic Stability Dividend*. Effective the first day of the first full pay period after April 1, 2018, by one-half of one percent (0.5%). Effective the first day of the first full pay period after February 1, 2019, by one percent (1%) plus the Economic Stability Dividend*. The temporary instructional rate shall be paid in biweekly installments over the period of the actual teaching assignment. Assignments taught during the normal fall and/or spring semesters will be paid over a period of 16 weeks. This duration will be extended or shortened to reflect the period of the actual teaching assignment for courses taught outside of the normal fall and/or spring semesters. *Economic Stability Dividend is described in Article 11.1.1. 11.1.4.3 Non-regular faculty not already in receipt of health and insurance benefits under Article 13 shall be entitled to payment of eight percent (8%) biweekly in lieu of health and insurance benefits. If the employee is participating in an employer paid LTD plan, the payment in lieu of benefits shall be reduced to six percent (6%). Any and all allowances or stipends for administrative duties shall be reported to the Committee of Personnel Stewards of the Association by the Administration each semester by September 30 or February 28 as appropriate. The University shall pay the expenses, as per section 42.08 of the Vancouver Island University Policy Book, of a faculty member when on University business as approved by the Dean of Instruction. In instances where no other means of transportation can be made available by the University, and a faculty member is required to drive his/her personal vehicle for Vancouver Island University business more than six days in one calendar month in his/her I.C.B.C. year, then the University shall pay the extra costs of necessary insurance. Prior approval of the senior administrator is required. A copy of insurance documentation reflecting additional 007 coverage premium costs must be attached to the claim for reimbursement. A faculty member using their own vehicle for eligible and approved travel shall be entitled to reimbursement for the use of that vehicle in the amount equal to the per kilometer rate set out in Vancouver Island University Policy and the Guidelines for Reimbursement of Travel and Other Expenses. If a faculty member is directed to perform and performs work away from their home campus (in the case of a temporary faculty member away from the campus(es) of their posted assignment(s)), the faculty member will be entitled to claim all other eligible expenses actually incurred in accordance with the Guidelines for Reimbursement of Travel and Other Expenses. employment and as specified in the posting, that the faculty member belong to a professional association Vancouver Island University shall reimburse the faculty member for any fee paid to maintain membership in that professional association. 11.4.1.1 Initial salary placement shall take place upon appointment. Upon reappointment of a limited term contract or temporary non-instructional faculty member, salary placement shall not take place unless such reappointment occurs more than one academic year after the expiry of the last limited term contract or temporary non-instructional appointment. 11.4.1.2 A candidate who may be appointed to a position shall be asked to complete a “VIUFA Salary Placement Experience Credit Data Summary” form, as contained in Appendix B. 11.4.1.3 “Initial Salary Placement Forms” are used to place all candidates for regular and non-regular positions, except those to be paid the rates given in Article 11.1.4.2. Samples are provided in Appendix C and Appendix D. A completed form used to evaluate each new faculty appointment must be signed by the Executive Director of Human Resources or designate, and be given to the candidate with the letter of appointment. The candidate shall not be required to accept or reject an appointment until at least 24 hours have elapsed after he/she has received this form. 11.4.1.4 A master file of all completed VIUFA Salary Placement Experience Credit Data Summary forms and Initial Salary Placement Forms shall be kept in the Human Resources Office. Copies of the VIUFA Salary Placement Experience Credit Data Summary form and the Initial Salary Placement form for each successful candidate shall be sent to the Chief Personnel Steward of the Association. 11.4.1.5.1 Only credentials from accredited institutions shall be recognized when awarding initial minimum placement and for incremental progression based on completion of Master’s or Doctorate degrees. In initial placements an equivalency may be established in lieu of a formal diploma or degree, (Article 11.4.1.5). In such case, credit may be granted toward an equivalency on the basis of two or more years experience equals one year of a diploma or degree. The actual value of the experience shall depend on the nature and relevance of the experience. Where experience is used to establish equivalency, it cannot be used for salary increments. 6) other employment in field of instructional assignment after date of first Diploma, Degree or Teaching Certificate. 4) other employment after date of first Diploma, Degree or Teaching Certificate. 8) other employment in field of instructional assignment after date of first Diploma, Degree or Teaching Certificate. 3) other employment after date of first Diploma, Degree or Teaching Certificate. Note: Directly related experience for those employees whose primary assignment is Counselling shall be limited to Counselling experience. Directly related experience for those employees whose primary assignment is Advising shall be limited to Advising experience. 6) other employment in field of primary assignment after date of first Diploma, Degree or Teaching Certificate. 1) counselling or advising at levels below senior secondary level of public and certified private schools or equivalent. 5) other employment after date of first Diploma, Degree or Teaching Certificate. 1) teaching, research, and work in field of assignment at post-diploma or equivalent level. 1) teaching, research, and work. 11.4.1.7.1 Part‑time teaching experience shall be pro-rated based on a two‑semester teaching year. Other part‑time work experience shall be pro‑rated based on a 35-hour work week and 12-month year. In no event shall more than one year experience credit be granted for experience in any 12-month period. 11.4.1.7.2 Teaching of non‑credit courses shall be excluded. 11.4.1.7.3 The decimal fraction of a year’s experience leading to initial salary placement shall not be carried forward as a credit towards an increment on the salary schedule. 11.4.2.2 A technician who, as part of his/her workload, has responsibilities for instructing and evaluating students in a laboratory or other teaching situation shall be placed as both a Professor and a Technician (Articles 11.4.1 and 11.4.2) and shall be paid for the proportion of time devoted to each of the two activities as determined by the Program Group Workload Committee. Other conditions of employment shall be determined by this same ratio. The duration of the teaching assignment shall be set at the time that the technician accepts the assignment. 11.4.3.1 Appeals on initial salary placement may be made on questions regarding the interpretation and application of the salary placement criteria. 11.4.3.2 Appeals on salary placement shall be made to a Salary Placement Appeals Committee which shall consist of the following: the Vice-President Academic, the appropriate Dean of Instruction, and four (4) faculty members elected annually in May by the Association. The Chief Personnel Steward of the Association, or designate, shall be the advocate for the faculty member involved. 11.4.3.3 The Vice-President Academic Provost and the four (4) faculty members on the Salary Placement Appeals Committee shall elect a Chair in May. The Chair shall be responsible for calling meetings of the Committee as necessary. 11.4.3.4 A new faculty member must initiate any appeal regarding his/her placement on the salary schedule within ninety (90) days of commencing duty at the University, or within sixty (60) days of receiving the placement form, whichever is the later. The Chair of the Salary Appeals Committee shall call a meeting of the Committee within sixty (60) days of receipt of an appeal. 11.4.3.5 The decision of the Salary Placement Appeals Committee is final. A regular faculty member or limited term contract faculty member who has been placed on the salary schedule shall not receive a new placement if he/she is reassigned to another position within the same salary scale, at any time after he/she has been appointed to more than a one‑year term. 11.5.1 Faculty members who complete additional formal qualifications shall be awarded additional increments corresponding to the differences indicated in the criteria for initial placement (Articles 11.4.1.5 and 11.4.2.1). Where experience increments have been given for work toward the additional formal qualifications (not teaching) an additional educational increment shall not be given within the same year for the completion of the said qualifications. 11.5.2 Placement on a new step within a category, resulting from a faculty member’s completion of additional formal qualifications, shall be effective from the first day of the pay period following receipt of formal notification by the appropriate Senior Administrator and the Executive Director of Human Resources with notification of change to the appropriate Vice President. 11.8.1 Since experience usually results in improved teaching ability and/or increased knowledge in an area of expertise, a faculty member can normally expect an annual increment on the basis of this experience. Each part‑time faculty member shall accumulate experience credits in the same proportion as his/her salary compared to the salary he/she would receive as a full‑time faculty member. If the increment is not granted, the Dean of Instruction must state the reasons in writing to the faculty member by February 15 of the year preceding the contract year when the increment is to be withheld. The Committee of Personnel Stewards of the Association may make representation to the Vice-President Academic should the faculty member so request. Increments will be effective on the first day of the pay period following that date in which the faculty member accrued 1.000 credits towards an incremental salary increase. Normally, only one work experience increment or additional educational increment shall be awarded in a twelve‑month period subject to Articles 11.5.1 and 11.5.2. 11.8.2 Full‑time faculty members who have appointments in more than one category of the salary scale (that is, those who have split appointments) shall have the salary in each category fully incremented annually. 11.9.1 The Provincial Salary Scale is attached as Appendix A. (a) Effective January 1, 2013, all annual rates of pay in Appendix A of the collective agreement which were in effect on December 31, 2012 shall be increased by one percent (1.0%). The new rates shall be rounded to the nearest whole dollar. (b) Effective April 1, 2013, all annual rates of pay in Appendix A of the collective agreement which were in effect on March 31, 2013 shall be increased by one percent (1.0%). The new rates shall be rounded to the nearest whole dollar. (c) Effective September 1, 2013 or the date of tentative settlement of the local parties’ Memorandum of Agreement (whichever is later), all annual rates of pay in Appendix A of the collective agreement which were in effect on August 31, 2013 shall be increased by one percent (1.0%). The new rates shall be rounded to the nearest whole dollar. (d) Effective January 1, 2014, all annual rates of pay in Appendix A of the collective agreement which were in effect on December 31, 2013 shall be increased by one percent (1.0%). The new rates shall be rounded to the nearest whole dollar. Salary Scale which is referenced as Appendix A of this Schedule. 11.9.2.1 (a) Effective January 1, 2013, all steps on secondary scales which were in effect December 31, 2012 shall be increased by one percent (1.0%). The new rates shall be rounded to the nearest whole cent or dollar as applicable. (b) Effective April 1, 2013, all steps on secondary scales which were in effect on March 31, 2013 shall be increased by one percent (1.0%). The new rate shall be rounded to the nearest whole cent or dollar as applicable. (c) Effective September 1, 2013 or the date of tentative settlement of the local parties’ Memorandum of Agreement (whichever is later), all steps on secondary scales which were in effect on August 31, 2013 shall be increased by one percent (1.0%). The new rates shall be rounded to the nearest whole cent or dollar as applicable. (d) Effective January 1, 2014, all steps on secondary scales which were in effect on December 31, 2013 shall be increased by one percent (1.0%). The new rates shall be rounded to the nearest whole cent or dollar as applicable. 11.9.2.2 Despite Article 11.9.2.1 above, local parties may elect to revise secondary scales to the extent possible within a weighted average of the salary increases specified in Article 11.9.2.1. Where an employee covered by this Agreement becomes employed within two (2) years by another institution of the former Common Agreement also covered by this Agreement, initial placement shall be made at the higher of the placement formula at the hiring institution or his or her current or most recent salary step. This will only apply when the employee becomes employed in the same or a substantially similar field. The normal probation provisions of the hiring institution will apply. College of New Caledonia, College of the Rockies, Camosun College, Capilano University, Douglas College, Kwantlen Polytechnic University, North Island College, Northern Lights College, Northwest Community College, Selkirk College, Thompson Rivers University, Vancouver Community College. Vancouver Island University will review its division of annual pay into pay periods to ensure that employees receive the full or pro-rated (as applicable) gross annual salary in the Provincial Salary Scale in Appendix A.
a reduction of workload in a subsequent year that is commensurate with the amount of the overload. The conditions governing overloads are as set out in the regular employee’s local collective agreement, subject to the above provision.